Normally we save the “Yakkin” verbiage for the Wednesday Yakkin’ With YaJagoff videos but…. 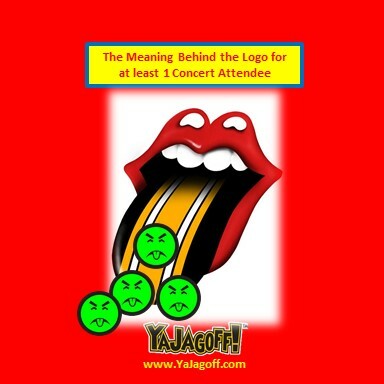 As you well know the Rolling Stones came to town and allowed many young fans to see them for the first time but, worse, allowed many adults and seniors to relive the youth that has passed them by. The Stones haven’t been here since 2005. So Saturday night Pittsburgh got a blast from the past. And the girl in 532 row U seat 7 got a blast from the lady in row V seat 7. While the rain finally cooperated the 12 Cranberitas in row V did not. Somewhere around the first chorus of Tumbling Dice, row V decided to tumble her dice on to row U. Ya have to love these people that pay $200 for a ticket to the concert…spend another $100 on pre-event booze and food and then a few more bucks on their concert beers and food and maybe another $45 on a special concert t shirt and then, completely miss the concert because they pass out or, as in the case with lady in Row V, Seat 7, get removed by security for puking on the people in the seats in front of her. GOOD TIMES…just like band camp or behind the bleachers at the high school homecoming football game. The good news is the tickets were only extremely expensive and there is a 99% percent chance you will never see the Rolling Stones again (1% says yes as long as Keith Richards continues to snort moon dust which he reportedly now has issues discerning between that and his senior-required body crevice talcum powder). So don’t worry, I’m sure your decision to “pre-game” like prohibition just ended was a wise one, YaJagoff! The #FloatingPrimanti.. THIS SUNDEEEE !